We have been to Walt Disney World 3 times now – with our 4th* vacation under 100 days away! (Hence, 100 Days of Disney!) I’ve done my fair share of planning where we are going to be dining onsite (referring to Disney’s restaurants) and offsite (the rest of Orlando!). *2017 UPDATE – we’re planning our 6th trip for Christmas! Since this is #100DaysOfDisney, I’m focusing, of course, on dining around Walt Disney World, and with over 100 restaurants to choose from, the ability to book 180 days in advance, and the fact that there are some seriously hard to get reservations, you are going to have to do some planning! I’m often asked “but do I really have to do any planning, can’t I just walk up and…. ?” The short answer is yes, then no. You don’t have to go all A-Team on your planning, but if you want to have breakfast with a Princess or watch fireworks from California Grill, and other fantastic Disney dining experiences, then yes, you will need to plan for it. Please don’t expect to walk up to Cinderella Castle, after promising your children that you will be having breakfast with Cinderella, and to get a table – it’s not going to happen my friend! If you are staying onsite at one of Disney’s Resorts, you may well have a Disney Dining Plan (DDP), which I have talked about in this post. Dining at Walt Disney World is not cheap, so if you do not have a dining plan, cost is something to bear in mind. On our very first trip to Orlando in 2011 we did most of our dining offsite at local chain restaurants, with just a couple of meals at Disney. The same for our second trip. However, it was all about the food for Dine Around Disney 2014! We actually upgraded to the Deluxe Disney Dining Plan (DxDDP) in 2014, which meant we didn’t have to worry about paying out of pocket for any dining and snacking that we did during our holiday. As a family, this plan suited us, even with the added cost of upgrading. 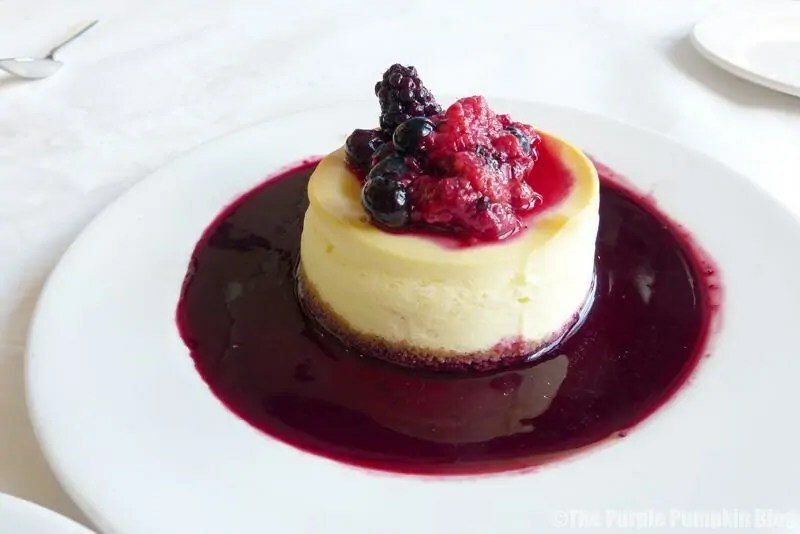 But this isn’t a post discussing the pros and cons of the different dining plans that are available, it’s about how to plan and book your Advance Dining Reservations (ADRs), which you can do, whether you have a DDP or not. It’s quite likely that you’ve booked your holiday to Orlando around a year (or more!) in advance. This gives you plenty of time to figure out where you and your family would like to dine at Disney. This may be one of the table service restaurants, a quick-service (counter) restaurant, a signature restaurant, dinner show, or just a quick snack from one of the hundreds of carts and kiosks around the World! This post contains Amazon Affiliate links, and are marked with an asterisk (*) . If you clicked the link then made a purchase, a small percentage of the sale price would be paid to this me. It doesn’t cost you anything more but it helps keep the lights on over here! How do I know where we will want to eat? Walt Disney World’s website – which is where you will also book your ADRs. AllEars.net – has pretty much every Disney dining establishment’s menus, and is updated regularly too. , which contains very honest reviews of every Disney restaurant. Disney Food Blog – with pictures, reviews and more. 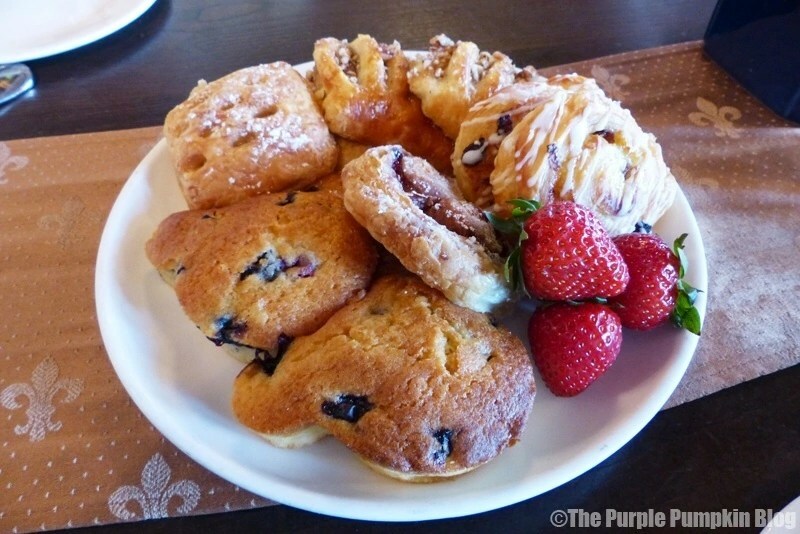 Disney Dining on The Purple Pumpkin Blog – of course I’m going to give my blog as a resource! I’ve got the reviews and photographs from all the places we have eaten at Walt Disney World – more being added as I re-organise my blog! Unnofficial Guide to Walt Disney World* – another great guide book – has ratings for all the restaurants too! Now go through all of the table service restaurants – as these are the ones that you will need to make ADRs for – you do not have to make ADRs for counter service – and take a look at the menus. You’ll quickly see if it is a somewhere you and your family would like to eat. 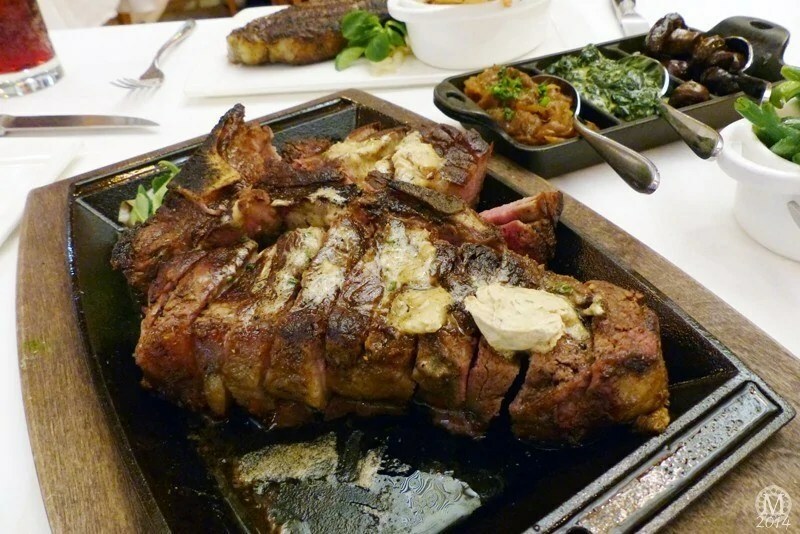 For example, if you really don’t like seafood, you are probably not going to want to go to Fulton’s Crab House, but if you LOVE steak, you might want to dine at Yachtsman Steakhouse. If you have little girls who want to meet the Disney Princesses, then there is Cinderella’s Royal Table – or the slightly more affordable (and in my opinion, much nicer!) Akershus Royal Banquet Hall. Once you’ve kicked out the places you don’t want to go to, you are left with the ones you do want to go to! If you’re like us, there will be too many, so you have to narrow those down again – and then decide on which ones for breakfast, lunch or dinner. Only YOU can make that decision for your family! We know what we like, what we don’t, and what works for us. Hopefully, all of my blog posts about Disney Dining can give you a bit of a guide. Armed with a final list, make a note of times you might want to eat at. For us, we like a very early breakfast (7:30/8:00 am), and a late dinner (8/9pm), which means we can have a snack during the day to see us through. Or, we have an early lunch (11:30am/noon), and a later dinner. Prepare to be flexible on your times, especially at the very popular restaurants; and also, be aware that Advance Dining Reservations, means that you have a reservation and will be seated before any walk-ins, but you may have to wait for your table, even with a reservation. We have had to wait up to 30 minutes after our time slot. Factor this into any plans you have for that day. This is the magic window – this is the earliest that you can book your ADRs. This is where it can get confusing, and I hope I can explain it as clearly as possible! If you want to book a restaurant on the 1st day of your holiday and the 7th day of your holiday, you can only book 180 days before both of them. So, you will have to book in stages, as the 7th day would mean you still have 187 days to go! Does that make sense? You’ll soon be told on Disney’s reservation system if you can’t book yet. 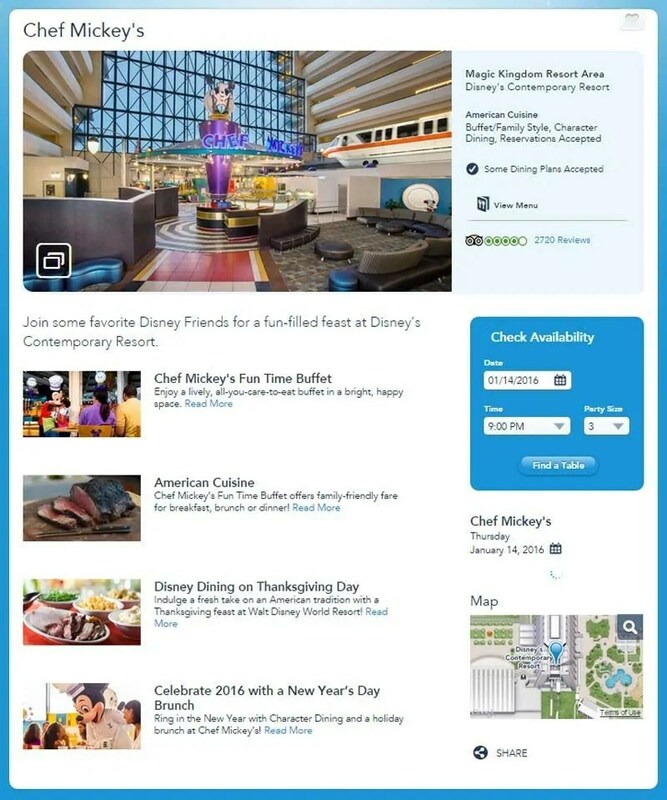 If you are on a Disney Dining Plan, you will be able to book 180 days out + 10 days, so you can book the first 10 days of your reservations all at the same time; thereafter, for any remaining days, book them one day at a time. 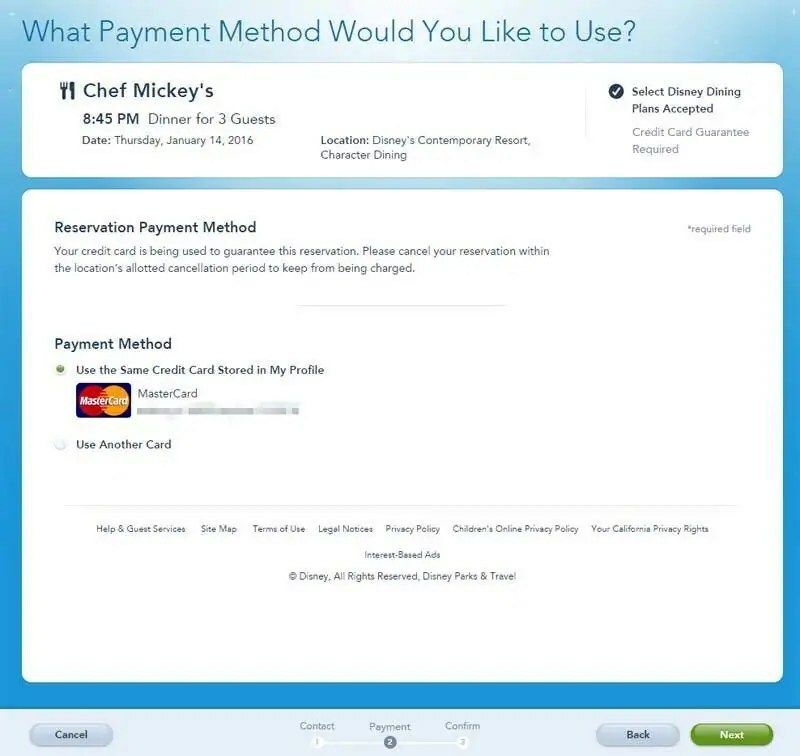 You will need your credit card – Disney charge upfront for some reservations – Cinderella’s Royal Table is one of them, as are some of the dinner shows. You will clearly be told if you will be charged in advance. Your credit card will also be charge $10 per person if you do not turn up for your reservation – unless you cancel 24 hours before (or 48 hours in the case of dinner shows). Always check the small print on Disney’s website, as it is subject to change at any time. Sign into My Disney Experience (MDE), then under “Things To Do” select “Make Reservations”. 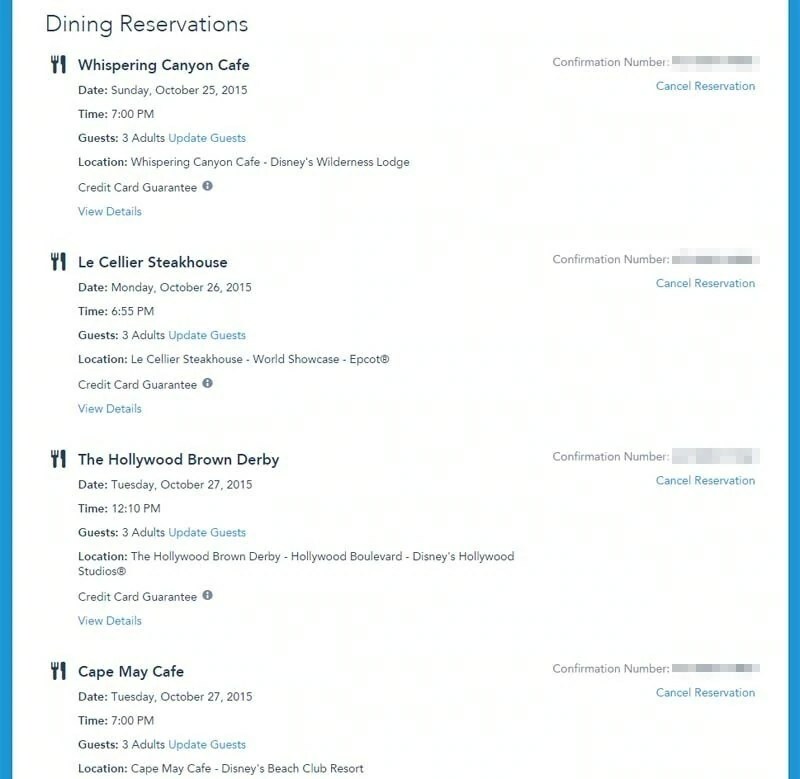 You can use the filters to sort by dining experience, price range, cuisine, guest rating and Dining Plans accepted. 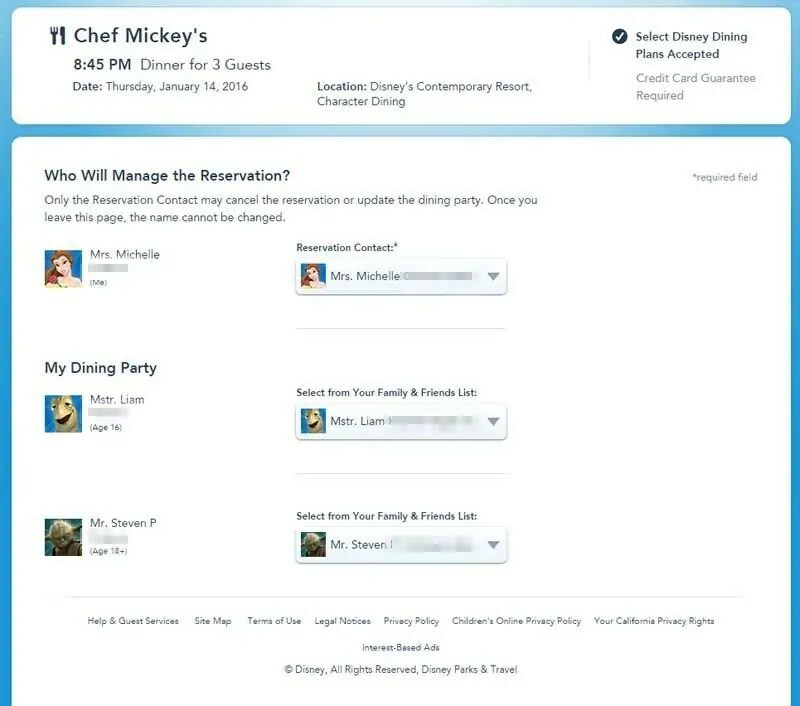 You can also select the park or resort that the restaurant is in, or just start typing in the name of the restaurant, and Disney will find it for you. And finally, if you want to just leave it up to what is available, you can choose your date and time and see what comes up! 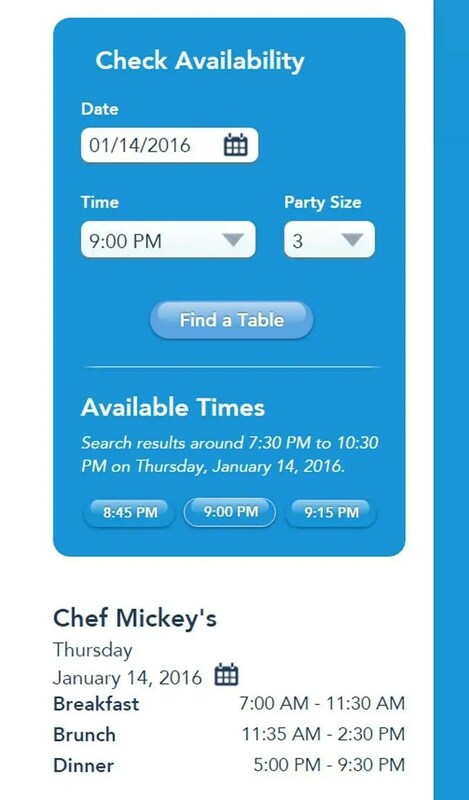 Here is an example for making a booking at Chef Mickey’s at Disney’s Contemporary Resort. Each restaurant’s page will tell you more about the location, the food, you can see the menu, read reviews, and more. And of course, check availability to make your booking. Once you’ve put in your date, time and party size, simply click find table. It will either present you with timeslots available, or tell you to check another time. Select the time you would like and then you are taken to a screen where you pick the diners from your MDE list. You are required to have a Reservation Contact, but if you are making a reservation for you and your friends, you just add them as a guest. It’s not something that Disney check with you when you go to the restaurant. Click next to confirm, and you will then be sent an email with your booking reference number, which is also linked to your MDE, and you can see all your reservations there too. You need this number to cancel a booking, but you don’t actually need it when going to the restaurant – just the name of your reservation contact. However, if there is a problem, simply open the MDE App on your smartphone to show the Cast Member. And that, as they say, is that! 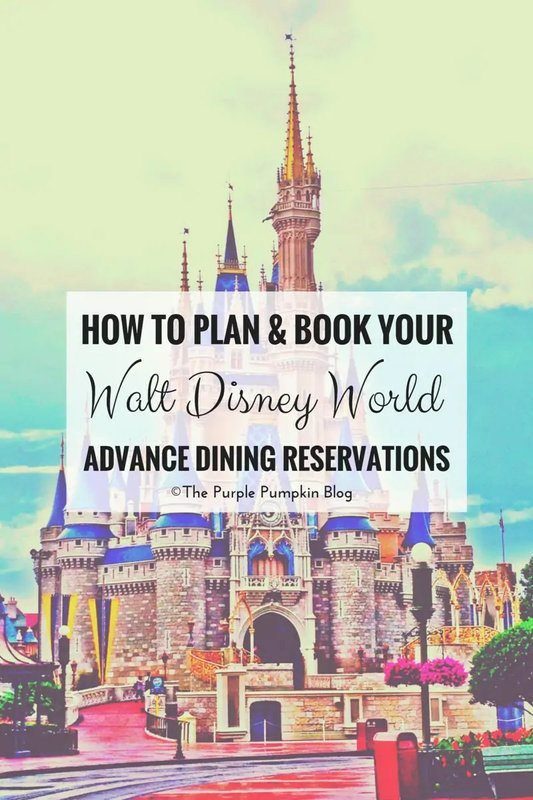 It’s pretty simple once you know what you are doing, and the harder reservations (Be Our Guest and Cinderella’s Royal Table) can be nerve racking to try and get, but it is possible! But once they are all done, you can sit back and know that your Disney Dining has been taken care of! And, if you don’t want to do it online, you can phone Disney and book over the phone. If you have any questions about Disney Dining, then please, do feel free to ask me in the comments section below, or to ping me an email, and I’ll answer to the best of my knowledge! Thanks for reading Day 14 of 100 Days of Disney 2015! 86 to go! Come back tomorrow for another Disney post! My understanding is, even if your are paying with the dining plan, you could still be a potential “no show” to a reservation, in which case they charge $10 per person (unless you cancel it within 24 hours). So yes, you still need to put your credit card it – it won’t let you book an ADR without it! Hope that helps!